Duong is 24-years-old. He has been working as a receptionist at a budget hotel in a touristy coastal town of Vietnam for four years. His earnings mean he can be considered middle class, though his lifestyle is far removed from what the middle classes can expect in wealthier countries. The Vietnamese state recently increased the monthly minimum salary from VND 1.9 million (US$89.3) to VND 2.7 million ($128). With occasional tips, Duong’s income is definitely over $2 a day – commonly accepted as demarcating the poverty line in developing countries. He owns an old motorcycle, a mobile phone, and he watches MTV Vietnam from time to time. Duong initially came here from his village to work in a local fish factory. But he quickly learned English, got a job at the hospitality sector, and has become upwardly socially mobile. His family back in the village are farmers. He is the eldest son; his four younger siblings still live in the village. He sends as much money as he can back home, and hopes that his siblings will be able to continue their education and have good lives. He hopes that they will do even better than him and is determined to support them. A recent study conducted by Boston Consulting Group revealed that Vietnam has the fastest growing middle-class population in Southeast Asia; and the middle and affluent class in Vietnam will double in size between 2014 and 2020, from 12 million to 33 million. Therefore Duong, his colleagues and potentially his siblings represent the wet dreams of transnational companies: they are youthful, brand-aware members of a rising middle class who have modest, yet relatively steady incomes, and have aspirations that are influenced by Western media. It is through people like him that transnational companies are to penetrate into new markets and maximize their revenues. But people like Duong, who have barely made it to the middle class, face an ongoing struggle to stay where they are and not fall behind. Especially in a volatile industry like hospitality, which hires people when there’s a rush and fires them during the low season, people like Duong have to work unenviable hours to keep their jobs and accumulate funds to get through the low season – as their families depend on money being sent home all year round. Thanh, a friend of Duong, works as a guide on a tourist boat by day and as an animator in hotels by night. ‘I didn’t have a single day off in the last three months or maybe more,’ he says. Thanh suffers from panic attacks and severe anxiety, and tries to deal with them with herbal remedies. One day, when he felt like ‘his heart was going to come out of his mouth’, he went to a doctor, and the doctor told him it was just anxiety. Thanh doesn’t know when he will take his next day off yet – probably not during the high season. He will continue to work as long and as hard as he can, because he knows that when the stormy season comes there won’t be boat tours and demand for hotel animators will drop. Duong and Thanh sometimes put in 20 hour shifts when thousands of people flow to the coastal town to relax and de-stress during the high seasons each year. Duong sleeps on a mattress in the reception area most evenings, including on special days and holidays. ‘I don’t have a choice,’ he says. As revealed by countless reports, the low middle class of the developing world now comprise the biggest income group in the world, and will remain the biggest driver of the global economy. But a recent analysis conducted by the Financial Times found that economic slowdown puts a billion middle-class people in the developing world at risk of experiencing downward class mobility, thus making calling into question the growth that enabled Duong’s class jump. Sadly Duong and Thanh joined the global middle class right before the economic party finished, and most likely a vague future of many more insane high seasons awaits them. 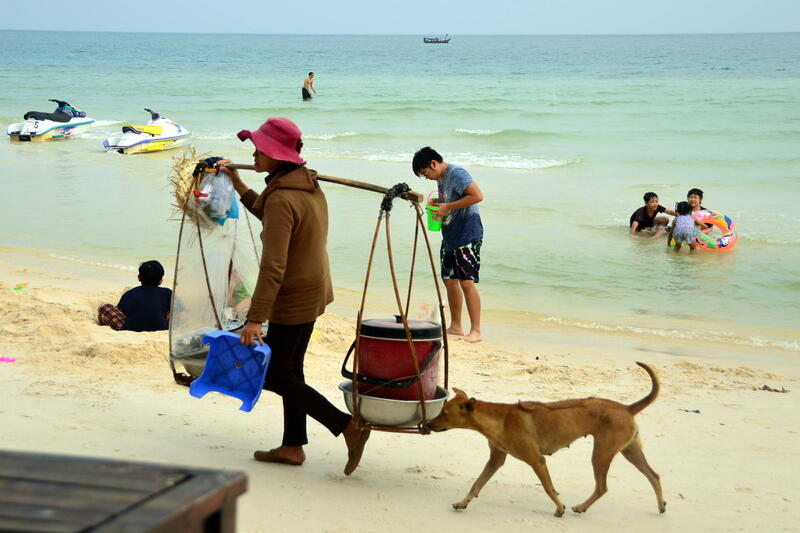 During the four years that Duong has been working at the hotel, he has never been to the beach that is right in front of him to enjoy the blessings of the tropical weather that attract thousands of tourists every year. Not once. This article appeared on the New Internationalist.